This book is a collection of original, thought-provoking essays on critical issues in contract, commercial and corporate law. 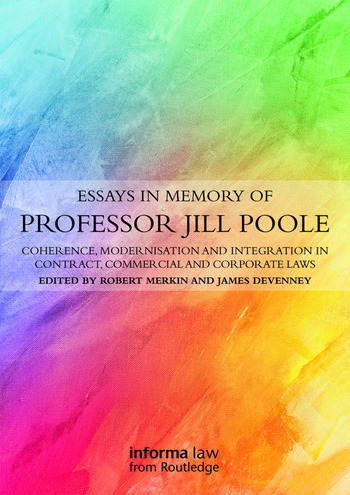 It is dedicated to the memory of the late Professor Jill Poole, who inspired so many and made such important contributions to these fields of law. The essays are written by leading practitioners and academics in the field, building on Jill’s work. As such this collection will be of interest and importance to professionals, academics and students in these fields of law. The Professor Jill Poole Educational Fund has been established in memory of Jill. It will be used to support undergraduate students in obtaining 'excellence scholarships' at Aston Law School and to reward 'excellence' at the annual law graduation ceremony. All contributions are welcome, and the royalties from this collection of essays have been donated to it. Robert Merkin QC is the Lloyd's Professor of Commercial Law at the University of Exeter and Special Counsel to Duncan Cotterill. James Devenney is the McCann FitzGerald Chair of International Law and Business at UCD Sutherland School of Law, University College Dublin, Ireland and Professor of Transnational Commercial Law at the University of Reading, UK.